Zoria: So far, so good. There should be another area accessible from the Desert other than the underwater area. You have all the items you can get so far. Edit: Oh, I see you found it. I'm in the 'Moon Meadows', with a playtime clock of 3h, 26m. Some of that may have been while I left the game running, so floor it to three hours. Are there other areas that I can visit, or am I locked into this one? Thus far, in terms of non-linearity, I can say that it still feels very linear. The difficulty spike for this section, is quite intense, and I feel as if I'm missing HP increases. Edited by ZoriaRPG, 18 August 2015 - 03:27 AM. Ridgewood Garden (the beginning area) and in the Moon Meadows. Both are hidden inside an enemy like the Magic Containers were, except these have some kind of indicator on the screen that hints at something being there. I wanted to have a detailed minimap for this game, but the only reason there isn't one is because I was running out of time. As for the raft and underwater sections, the raft script is actually Moosh's, and is currently in the database here. The underwater section is actually not scripted at all. It uses conveyers going down and tile modifiers to give the mermaid look. I'm glad you enjoyed both the areas. 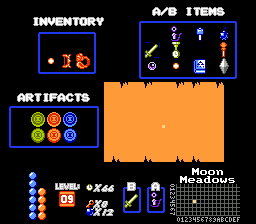 The Moon Meadows is pretty difficult. Since it's the next to last area I wanted to make sure that the player was prepared for the end. - In the village, Zephos says "unfortunant" instead of "unfortunate." - In the shop, the shopkeeper mentions that the tome will revive you for ten rupees, when I assume you meant stopwatches; I subtly referenced this in the review. - "You released all those monster on the world" during the final battle, which should be "monsters." @The Satellite: Thanks for reviewing it! You really described the game perfectly. I'm glad you enjoyed it! I have been taking all of the suggestions and critiques I've heard from here and on streams into consideration and will be working on making a mega-updated version of this game later this year to make it an enjoyable addition to the database. Thank you for said suggestions and critiques! Also, that shopkeeper got really confused lol. Just finished this quest in my stream today. It's pretty great. The bosses are a liiiiiittle imbalanced (One of the bosses was super easy, and another had an odd hitbox), but that didn't detract the quality of the quest. 4/5, and keep up the good work. Don't you mean 10 stopwatches rather than rupees? Either way, this a really great quest so far. I'm loving it. This was a fantastic quest. I really got immersed into this with the new clever uses of items and enemy weaknesses, which really made great use out of items rather than the sword. Screen design was pretty great. I found a few errors here and there but it's nothing major and was pretty well designed for a quest being made in 2 weeks. Design choices were pretty neat and gimmicks for each area were very cool. I really like the multiple uses of the Hammer, especially using it to harden lava. Enemies were a tad on the tough side, and I died quite a lot more than I was expecting. It could probably be the fact that the enemies damage are a bit too high which made the quest a bit harder than it was probably supposed to be. Another thing is that bosses were fairly easy, which I don't mind at all. However, I did notice that the Stalfos boss was way harder than the rest of the bosses in the game (except for the final boss), so there's a bit of a balancing issue there since I flawlessly beat all the other bosses, but not the Stalfos. This quest is also somewhat bug free, except for the swamp which is buggy as hell, but I'll let that slide since this was made in only 2 weeks and you already know about how buggy the raft in that area is. Nothing was too tedious besides that though and I had plenty of fun. Overall, this is a great quest. I recommend it to everyone, and it's definitely amazing for it being made in just 2 weeks, so good job to RedTribeLink. I already mentioned this you doofwad you are hereby FIRED and BANNED FROM PUREZC. Playing this quest. Honestly? I'm not joking when I say this might end up being my favorite quest. This quest feels really comfortable to play, with a rewarding leveling system and it feels smooth overall. I think the enemy balancing could be a little better, but I am in love with what is shown so far. I am going to finish it tonight hopefully! I've beaten the first boss so far and I like this quest a lot! It definetly has a chance to win this contest in my opinion. I got a feeling it will be focusing more on combat than on puzzles, which is fine though. I like the story, the areas and the ideas I've seen so far. Finished the quest at last! Not much to say other than it was amazing, and it has become one of my personal favorite quests. I might do a full fledged review when I get the time, but this gets my vote. It's comfortable to play and refreshing to boot. It's a little imbalanced but yeah. 4.95/5. Edited by Mister Snooze, 22 September 2015 - 11:17 PM. I really like the concept of this quest. Jumping through dimensional rifts and your weapon system kept things fresh. Your story was interesting as well. Are you planning on making a full quest in this style?